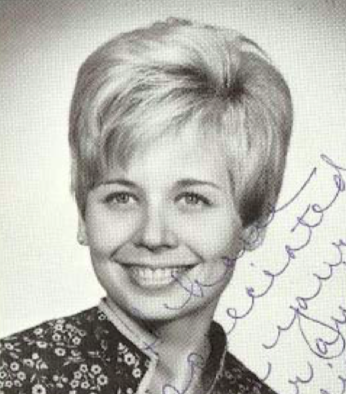 As you probably already know, Mrs. Jeanne Alsup was the junior English teacher for many RHS Class of 1969 grads during our junior year from 1967-1968. What you may not know is that Mrs. Alsup was also the inspiration for the creation of Punography Ltd.
We extended an invitation to Mrs. Alsup for her and her husband Al to attend the Punography Film Festival as our Special Guests of Honor. And, to our extreme pleasure, she accepted right away. In fact, what she said was "We'll be there unless we are dead!" Now that's a commitment, don't you agree? When you think about it, how many teachers get invited to a film festival sponsored by students she taught and inspired 50 years previously ... AND accept? Not many, I would imagine. We are so proud and pleased that Mrs. Alsup (it's just so hard to call her Jeanne) and Al will be joining us for our evening of celebration and memories. The Punography Film Festival will be held on Friday, October 18, 2019 from 6-9pm at the Alamo Drafthouse in the Sun Rexall shopping center at Belt Line and Central Expressway -- advance drastically-reduced-price Early Eagle Tickets are sold out but stay tuned for the possibility of our selling On-Time Eagle Tickets in the future! And while you're at it, if you need a hotel room, go ahead and make your reservations at the Official Hotel -- the Marriott Courtyard. If you book your reservation by phone (972) 994-9933, tell them you are with the Richardson High School Class of 1969 to get the special $69 rate. If you experience any problems, click here to email our Hotel Liaison. Click here to join the Punography Ltd. RHS Class of 1969 website and be assured of getting email updates on the Punography Film Festival!